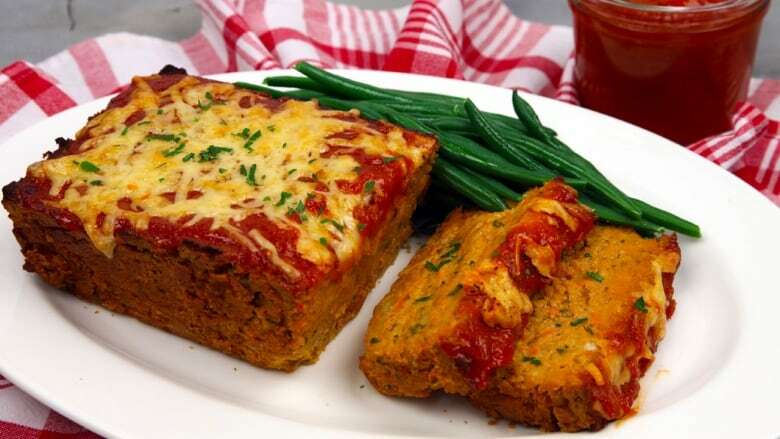 Trick your friends with this tasty veggie meatloaf. Full of fibre, protein and most importantly flavour — it’s the perfect dish for Meatless Monday. Add all ingredients to a small pot. Heat on stovetop for 10 minutes, then remove from heat. Reserve for later. Add oil to pan over medium high heat. Sauté onion, carrot, celery and garlic until softened. Add spices, tomato paste and cook for 2-3 minutes. Take off heat and let cool slightly. To a food processor, add cooked vegetables, herbs and drained and rinsed chickpeas. Pulse to a coarse crumb. Transfer to a large bowl. Add almond flour, whisked eggs, Worcestershire, 1 cup gouda, salt and pepper, mix until fully combined. Spray a loaf pan with cooking spray or grease with butter. Add mixture to tin. Brush generously with BBQ sauce. Top with remaining cheese. Bake at 375F for 15-20 minutes.